All of the information on this site is free. It is not a business venture, it is a personal site aimed at helping the uninformed gain some basic information about what is required to help them gain that first oil rig job! Oil rig jobs are not easy to come by, it takes a lot of effort time & patience. You need a structured approach. A lot of people do not realise that the best chance of getting an oil rig job lies with the drilling companies that own and operate the oil drilling rigs. They do not understand that the big oil companies like Shell, BP, ExxonMobil, ChevronTexaco etc do not hire the likes of Roustabouts and catering staff. They do not even hire Drillers or Crane Operators. Most jobs on oil rigs are filled by agency staff or, in the case of a lot of the drilling companies, their own staff. But trying to get your first oil rig job by applying to one of the major oil companies is a waste of both time and effort! 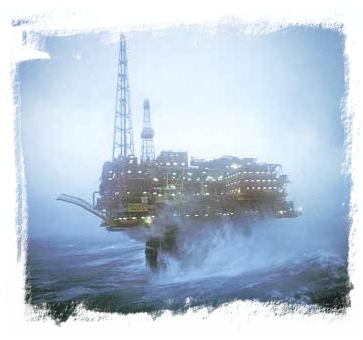 Use the menus to navigate the site to find out detailed information about various aspects of the oil industry, the different types of oil rigs, what life is like onboard an oil rig and ultimately how to go about getting a job on an oil rig! Please do not email me your CV. I am not an employment agency. I can not give you a job. Please do not email me with questions like "Please tell me what I have to do to get a job on an oil rig......" It just wastes my time. All of the information I have is contained within this site. I hope you find the information useful, many others have - good luck and if you do go the whole way and get that first oil rig job please do email me, especially if you have found the information on this website useful! All information and images on this website are © Copyright Cleddau.Com - 2000-2004 - All rights reserved. Photographs are from a private collection and may not be reproduced in any way without permission. Site content may not be reproduced in any form without the express written permission of the author.